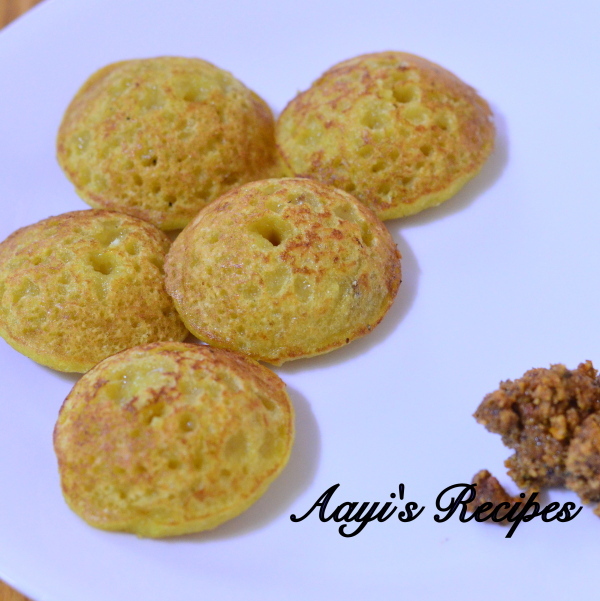 Appe is one of the very popular breakfast loved by adults and kids alike. We make different kinds of appe like urad dal appe, boiled rice appe, sugarcane juice appe all of which a little planning ahead. My sister-in-law makes these sweet appe with sooji which can be made instantly. This is a nice and quick breakfast when you need to come up with something for breakfast quickly. Grinding or fermentation is not required for these which makes it easier for even beginners. They taste great when eaten immediately. Mix all the ingredients in a bowl. Make appe. Quick and tasty appe made with coconut and sooji. Soak poha in yogurt for 20-30mins (if using thick kind). Mix all ingredients (do not grind. 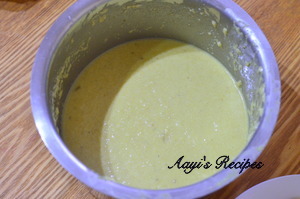 Mix with a spoon) to get to appe batter consistency. Heat appe pan and make appe. Looks fantastic. I prepare the similar kind of appes with all the above ingredients except yoghurt. I add ripe bananas. Next time I will try with yoghurt. 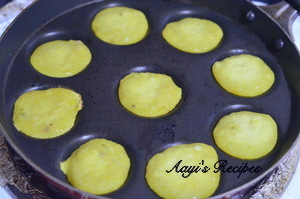 Today only I made appe with idli batter and you have posted the sweet ones. Can we use bansi rava for this appe. My 6 year old is a very fussy eater but loves anything sweet. Making lunch for him is the biggest challenge as he hates rice. And moreover I cannot send jam sandwich everyday. At least this one they won’t be able to I don’t have the Appa chatti u have used. Can it be made in idli dish by using muslin cloth? I don’t thick it will get crispy outside if it is steamed. Do we have to mix flour ,suji & soke in to the water and keep for fermentation?do we need to add soda? I am in US. I dont have a appen pan. Don’t know much about the appe pan. can you suggest some brand I can buy here. anyway this can be done without the appe pan? Yes, closest can be dosa. hi, Shilpa . the quantity of jaggery should be more i guess. btw why turmeric in a sweet dish? Turmeric gives the color. You can add more jaggery if you want them sweeter. Hi looks yummy! Do we need to use coarse or fine rava? Also if we use thin poha, we donot need to soak in yogurt, correct? Thanks!